.....Joachim Paul Grellert was born in 1916 in Breslau, Germany during World War I, the son of a talented self-taught artist named Richard Grellert. In the depressed economy following Germany's defeat, the Grellert family decided to immigrate to the United States and with the help of Richard Grellert's uncle as their sponsor the Grellert family arrived at Ellis Island on October 3, 1926, travelling to Portland, Oregon to settle that year. .....10 year old Joachim entered primary school in the Woodstock district in Portland, having changed his first name to "Paul" to avoid the stigma of having an overtly German first name in post World War I America at a time when anti-German sentiment still lingered. He eventually attended Franklin High School where his extraordinary artistic talents were recognized by his art teacher there, Mary Ellen Driscoll. Driscoll was an accomplished artist who trained professionally at the Art Institute of Chicago, the University of Oregon and Reed College, where she received a masterÕs degree in fine art. Realizing that Paul was preparing to drop out of High School to help support his financially struggling family, she arranged a meeting with Mrs. H.C. Wortman, whose husband was a principal of the Olds, Wortman and King Department store in Portland. Mrs. Wortman had a long history of involvement in the Portland arts community, having assembled a formidable collection over the years. She was also a friend of C.E.S. Wood, purchasing art for her collection from Cottier and Co. in New York through him. Mrs. Wortman agreed to sponsor Paul with a 4 year art scholarship which commenced in 1930 with his enrollment in the Museum Art School in Portland at age 14. He excelled in classes there under the tutelage of artists Harry Wentz, William Givler, and others and won 2 Carey prizes during his time there. 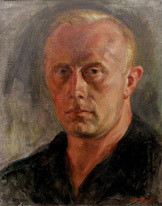 Along with fellow students Fred Farr, Maxine Seelbinder, and John Sullivan, Grellert left Portland to further his art studies at the American Artists School in New York in the mid 1930s, studying with prominent WPA era expressionist mural painters such as Anton Refregier and Philip Evergood. .....The entrance of the United States into World War II was a traumatic event for the entire Grellert family in Portland. Paul, who had attained United States citizenship, was drafted into the Armed Services in late 1941 and entered the Army Medical Corps, eventually being stationed in various South Pacific locations after training. Paul's parents, both now classified "Enemy Alien" by the government, were detained, separated and interned out of state, his father being sent to Bismarck, North Dakota and his mother to Seagoville, Texas. Paul's brother Ernie, still a minor, was also classified Enemy Alien, but was allowed to stay in Portland under restriction and curfew while he finished High School and completed his citizenship papers. Surviving letters that Paul wrote to his family were stamped "Enemy Alien" and subject to inspection by government officials. .....Grellert was eventually stationed in Manila, Phillipines for the duration of the war where he served as a medic. In 1945, he executed a series of murals for a Serviceman's club in Manila. These murals were executed in both watercolor and oil, depicting "scenes from the lives of peons in Mexico." He subsequently painted a series of pictures of the areas where he had been stationed during the war including New Caledonia, Luzon, Bouganville and Guadalcanal. .....Returning home from the war, Grellert married and with his wife Pat, moved to Olympia, Washington where he was employed as a sign painter for the Bureau of Parks. According to Grellert's family, Pat was not very supportive of Paul's artistic pursuits. Additionally, it appears through accounts of family members that the war left him suspicious and reclusive. He and Pat divorced and Grellert became less interested in obtaining consistent gainful employment, preferring to fish and hunt and occasionally working for his father's sign painting business, "Reliable Sign." Ironically, Grellert also did most of the door lettering for the new Union Hall built in the 1960s although he had never joined the signpainters union and was techincally a "scab." .....In 1938 Grellert entered an oil sketch entitled "Post Rider" in a nationwide competition for a commission to execute a Post Office mural under the Section of Painting and Sculpture for the United States Treasury Department. His natural talent in figurative work and portraiture was well-suited to the type of historically rooted and figuratively based works which began to adorn the walls of post office buildings across the country in the 1930s. Having won the commission to paint the mural for the East Portland branch post office, 22 year old Grellert set up a make shift studio in his family's garage to paint the mural. With the help of his younger brother Ernie (who also modelled for a number of the figures in the mural) Grellert installed the mural in early January of 1939. The mural was executed in tempera on canvas and was carefully glued in place. 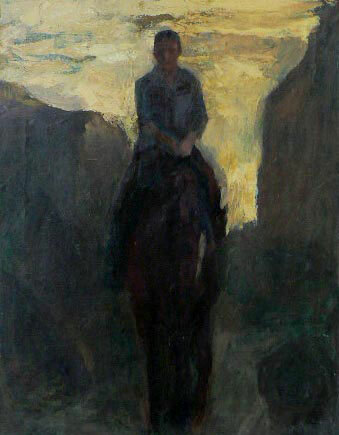 The following year, Paul exhibited two oil paintings at the first All-Oregon Exhibition. The titles of these works were: "Beach Scene" and "Paul Bunyan and the Big Swede," both carrying prices of $75. .....Grellert continued to paint wherever he went, and did countless quick and amazingly accurate portrait paintings and sketches. He formally exhibited only once after the war in a juried exhibit "Artists of Oregon" held at the Portland Art Museum in 1954. .....In the late 1960s, Grellert entered the East Portland Post Office and to his dismay discovered that his "Post Rider" mural had been unintentionally destroyed during the renovation of the building at that time. Apparently, there was an attempt to preserve the mural by covering it in plastic, but the old glue that held the mural to the wall gave way and the mural fell off the wall and was damaged. Unfortunately, no attempt was made to conserve the mural and it was thrown out. Grellert approached Post Office officials with a proposal to repaint the mural, which was accepted, and the "new" mural was completed in 1970. This version of the mural was done in oil and a number of changes were made, the most notable being the color of the horse from white to brown. The original WPA era competition sketch for the mural from 1938 resides at the Smithsonian in Washington, D.C.
.....Later in life, Grellert made his preferred medium watercolor. Developing a hobby of mushroom hunting, he painted a large collection of watercolor botanical sketches of various types of mushrooms. He became enamored with the work of Andrew Wyeth and incorporated this influence into his work in both oil and watercolor during the 1960s. As he aged he became increasingly reclusive and miserly, essentially living like a hermit in his modest Vanport era house in Southwest Portland. This trend accelerated further with the death of his second wife Gladys. He also became increasingly critical of his own work and unfortunately destroyed most of his early paintings, leaving perhaps no more than 50 extant works. Some earlier works were destroyed to recycle canvas for current projects. A number of oil paintings which have survived show evidence that he continued to rework his paintings continuously over the years, much like Albert Pinkham Ryder, the reclusive and eccentric 19th century artist whose moody works resemble Grellert's in a number of respects. Confirmation of this influence came from a book on Ryder which was eventually discovered among his personal papers. Paul died in Portland at age 88 in late 2005. In addition to oils and watercolors, he produced a small number of lithographic prints and diminutive sculptural works.